Quicken is still the king of personal finance software, but the last several years have brought a legion of challengers to its throne. Just glance at our personal finance software guide to see how stiff the competition has gotten. 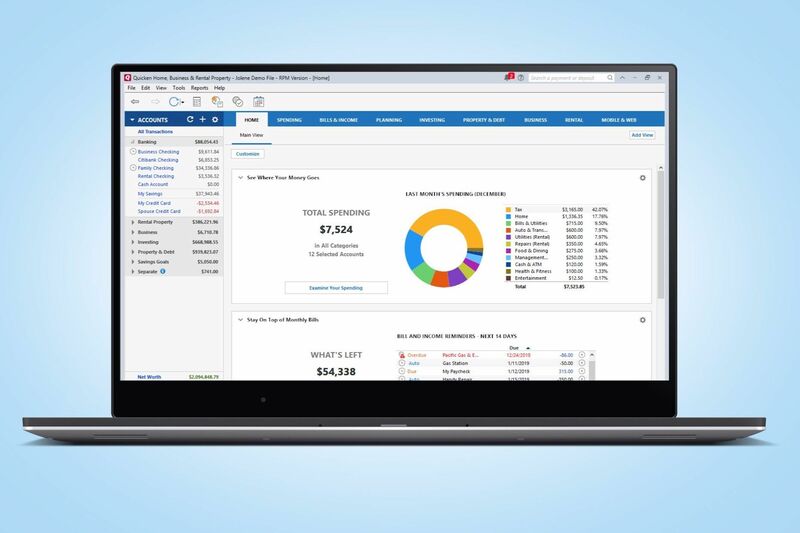 Perhaps that’s why Quicken 2019 has introduced a feature that devoted users have long desired: a browser-based companion app that lets them manage their finances from any internet-connected device. This streamlined tool gives Quicken a user-friendly vibe that will likely appeal to people weaned on web services like Mint and Nerd Wallet. At its heart though, Quicken is still a desktop program, and as in years past it’s offered in multiple versions. The Starter plan provides basic account management features for $35 a year. Deluxe, which is reviewed here, adds budgeting, investment, debt, and tax management tools and costs $50 a year. Premier includes free online bill payment and priority access to customer support, and Home & Business (Windows only) lets you more easily manage personal and professional finances for $100 a year. Note: This review is part of our personal finance apps roundup. Go there for details about competing products and how we tested them. Quicken looks much as it has in recent years. Financial accounts and balances are displayed in a left side column, and you can click on any of them to see more details. At the bottom of the column is your net worth and a link to your credit score, though you have to sign up for free Quicken Credit Score and Monitoring to see it. 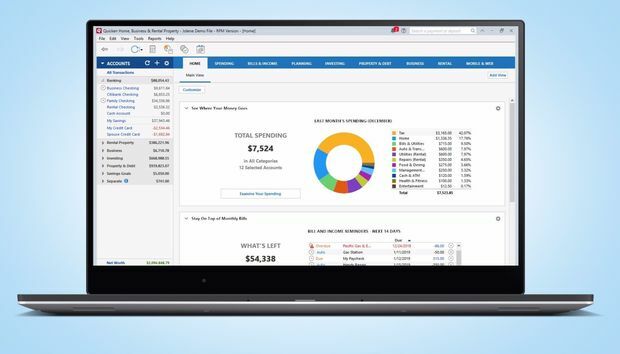 Quicken Deluxe 2019’s interface will look familiar to users of previous versions. The main pane is divided into a series of tabs. The Home tab remains the main interface and is designed to provide an easy-to-read financial snapshot. By default it includes spending summaries, bill and income reminders, and your current total-budget status. But you can customize it to include a variety of graphical data such as income-versus-expenses charts, tax projections, and a calendar display of daily financial activity. Despite a reputation for intimidating non-power users, Quicken Deluxe makes it easy for those of us with even modest financial resources to track the in- and outflows of household budgets. The Spending tab displays your last 30 days of spending from all your accounts in a colorful donut graphic, broken out by spending category. Like most things in Quicken, this is highly customizable and you can change time period, view spending by individual accounts, or switch from spending to income. Beneath the graph is a register of all the transactions relevant to the account parameters you’ve set. You can toggle these to view just expenses or income and split, annotate, recategorize, and further modify individual transactions. The Bills & Income tab allows you to see your projected income against your fixed expenses. It scans your selected account for deposits and recurring bills and projects your daily balances over a designated time range. Quicken offers multiple ways to view this data, including bar graphs and calendars, and you can mark individual bills paid, view the vendor’s billing statements, and set payment reminders. But unless you upgrade to Quicken Premier, you can’t actually pay the bill from the program. The Planning tab is where you can create a budget, and it works just as it has in recent Quicken versions. You select the categories you want to include and allocate spending limits for each. Quicken tracks your banking account activity and graphically displays your progress for each category and for the total budget. Other tools on this tab assist you with debt reduction, tax planning, and savings goals. Quicken’s web-based platform doesn’t replicate all the features of the various Quicken desktop programs, but it faithfully mirrors the ones you’d most want remote access to and makes working between the two interfaces seamless. 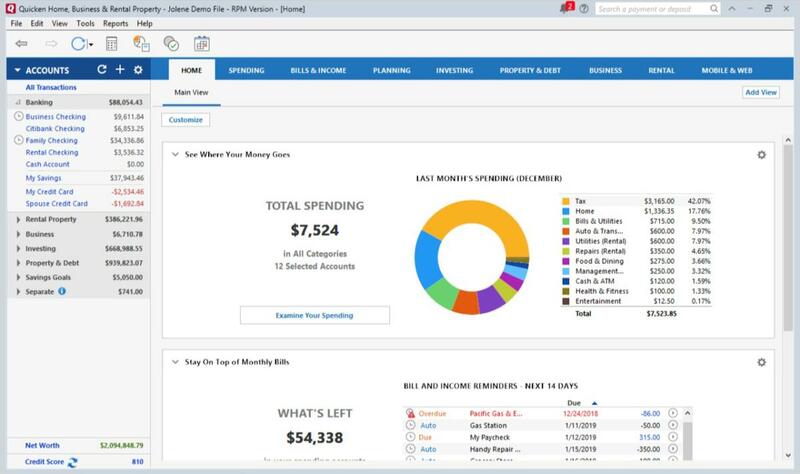 Quicken on the Web’s dashboard provides an overview of your synced financial data. Once you sync your Quicken data to Quicken Cloud through the Windows or Mac desktop software, you’ll be able to view it online by logging into the Quicken website. The Quicken on the Web dashboard provides an overview of all the parts of your financial portfolio. Account balances are listed in a left-side column, much the same as they are in the desktop program. 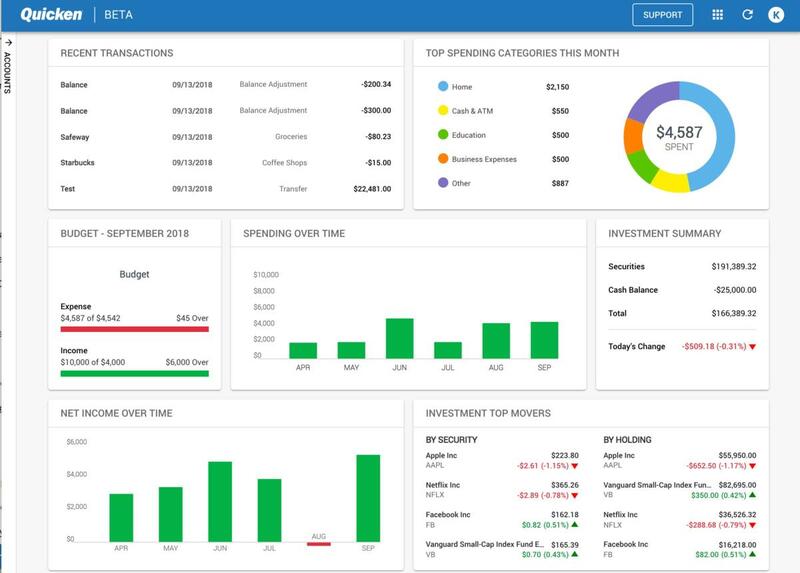 In the main pane are tiles displaying recent transactions, top spending categories, your budget, spending and net income over time, investment summary, and your top payees for the month. These are configurable though, and you can remove tiles you don’t use. While this dashboard provides a nice bird’s-eye view of your finances, you can dig into the details by clicking any tile. Selecting top spending categories, for example, lets you view your spending over time, by category, or by payee, in easily digestible charts and graphs. A register of transactions related to each view is also provided for you to work with. While on its own, Quicken on the Web isn’t all that complex, it does add to Quicken’s already steep learning curve. Fortunately, the interface adheres close enough to the desktop program that it’s pretty intuitive to explore. Quicken Deluxe is an excellent tool for getting a handle on your household finances, but it’s not for budgeting newbs. Confronting your money situation for the first time is daunting enough, and having to master this program’s comprehensive tool set could easily add another layer of resistance. A strict budgeting app like You Need a Budget or Every Dollar is a better place to start. If you’re a seasoned budgeter and want a deeper dive into your finances than you can get from a financial aggregator like Mint, Quicken Deluxe is a logical next step. With its head-spinning offering of reports and graphs, you can slice and dice your financial data with a precision no other personal finance software provides. Sure, it’s pricey relative to other financial apps, but if you have the financial resources to maximize its features, it’s an expense well worth adding to your budget.